With the bold choice the art director and musician homeowners made of painting their house a deep grey, it screamed for a plant palette that painted the yard with brush strokes of bright, fun shapes and colors that pop. They wanted a low maintenance, no fuss, drought resistant garden that expressed their eclectic sensibility. 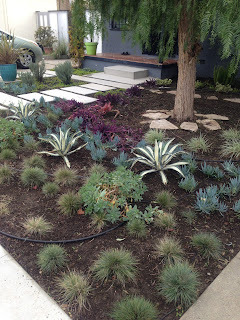 Against the house, variegated plants, succulents and grasses were included in the design and mass plantings were used to create fields of color and texture. The contemporary fountain was the perfect finishing touch to this charming Venice bungalow. Cynthia Hill and Beth Edelstein are the garden designers. Beth will be at the garden to answer your questions.